Charles Henry James, J.P. Born 1838. Died 1914. Mr. C. H. James was the second son of Mr. Job James, a a well-known resident of Cardiff, and was born at King's Castle, Canton, a picturesque house apparently of 17th century date, now destroyed, which stood upon the site at present occupied by the Forward Movement Hall. * A photograph of this house will be found in Cardiff Records,Vol. v., p. 327. He came of a family well known in South Wales for worth, intellectual power, and broadness of mind. As a boy, Mr. James showed distinct taste for Natural History, and when at school at Fishponds, near Bristol, made a collection of flowering plants and ferns of that neighbourhood, more especially from the ravine of the river Froome, near Frenchay. Well forward in all his school studies, he was especially good in mathematics. Being of very strong physique, he in many respects led in games as they were then carried on. From Fishponds he was passed to a school at Les Batignolles, near Paris, where he remained a year. Returning to this country, he proceeded to the North of England to study mining engineering, and on completion of his course, returned to this district, and essayed one of the earlier adventures in coal mining in the Rhondda Valley, at Cwmsaebren, now a part of Treherbert. 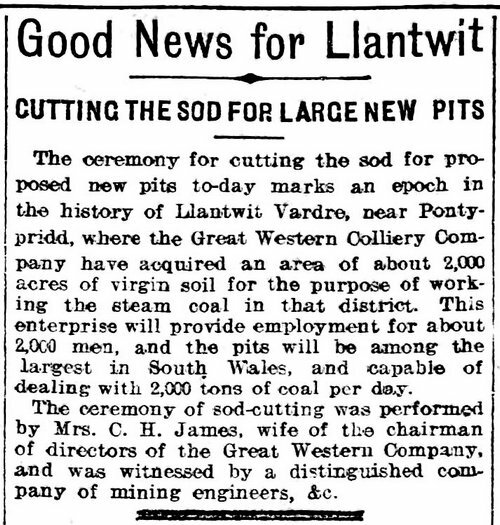 Meeting a heavy "fault," the effort was abandoned, and Mr. James removed to Merthyr Tydfil. Recognised as a man of high capacity, he was immediately successful, and for many years held posts of great importance in his profession. At no time was he without desire to aid in works of value to the public, and sat as member of the School Board and of other Bodies working for the benefit of the public. He held the office of High Constable. In 1893 he was placed on the Commission of the Peace for the County of Glamorgan. During his residence in Merthyr Tydfil his professional engagements and his interests increased largely and might have been expected to crowd out studies of less definite importance. The oversight and management of mines and his Chairmanship of Directors of the Great Western Collieries hardly afforded time for outside interests, yet he had his share in all scientific and literary movements going on in the neighbourhood, and continued to take a keen interest in art, especially water-colour and Wedgewood ware. Mr. James never forgot his home in Cardiff, and as long ago as 1871 he joined the Cardiff Naturalists' Society. In the same year Dr. C. T. Vachell became a member, and the Society mourns a double loss. 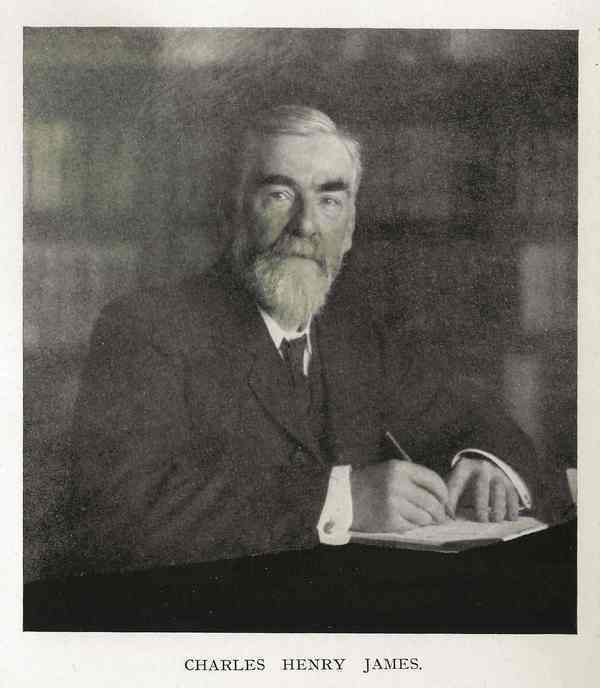 But Mr. James, while residing at Merthyr, could not be a very active member, though he did much in furthering the requirements of the Society, where possible, and there were loans to exhibitions and gifts to the Museum from his collections. 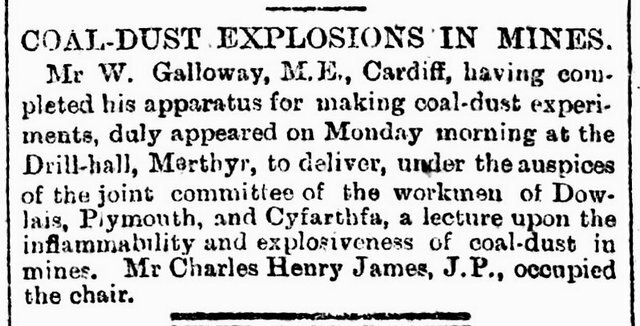 In 1897 Mr. James retired from many of his most pressing engagements and removed to Cardiff. Having more time free, he put himself into full communication with the Society and its Sections, becoming one of the most active workers, taking especial interest in the Archaeological Section during the period of excavations carried out by it. 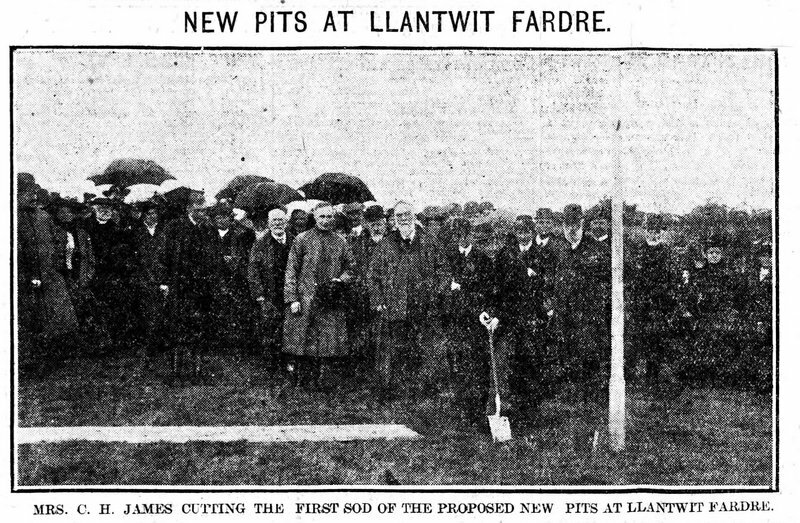 Mr. James' services to the Committee were of great value, and in 1902 he was elected to the Presidency, when he read a paper, The Geology of the Taff Valley." Other papers were The Great Flood, 1607," and Gelligaer Camp upon the opening of that excavation, of which Mr. James took preliminary charge, and later defrayed the expense of the illustrations to Mr. John Ward's elaborate report. He was a Governor of the University College and of Aberdare Hall during this period. In 1910, an attack of paralysis put an end to Mr. James' active life, yet his strength resisted the disease for long; successive attacks, however, occurred, to which he succumbed on October 28th, 1914. 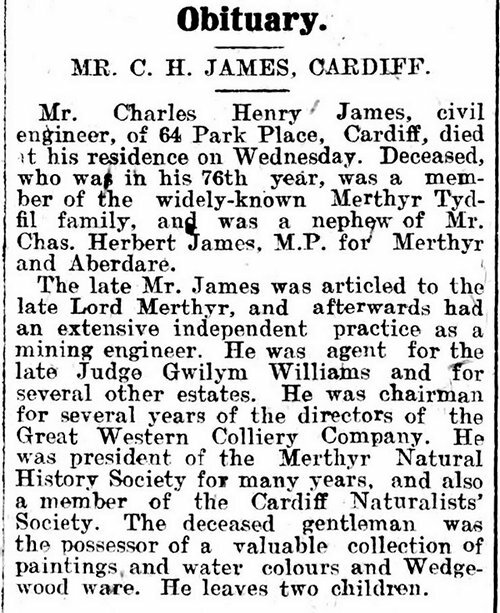 It is worth noting from that last excerpt, that in researching mr C H James you have to take care to ensure that you are identifying records that relate to our Charles Henry, and not Charles Herbert James his uncle who also had a great influence on the town of Merthyr and the surrounding area.